A black and white photograph of the Whitby Methodist Church. View is from the side. This Methodist Church was built in 1855/56 and opened on March 23, 1856. 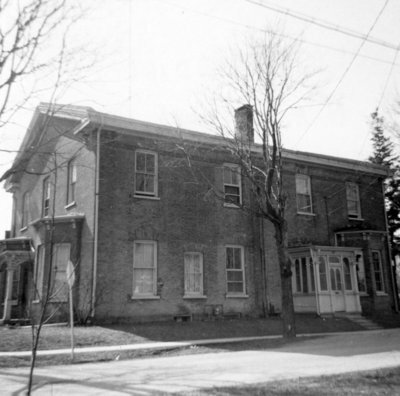 In 1876 it was replace with the Methodist Tabernacle at 201 Centre Street South. In 1877, Reverend John S. Clarke divided the old church into two apartments. Whitby Methodist Church, April 17, 1966, Brian Winter. Whitby Archives 09-004-065.